What can Guangdong’s ‘priority carriages for women’ and concurrent repression of feminists tell us about the Chinese state’s strategies for dealing with social antagonism? Last week, on June 26 and 28, new signature pink-signed metro carriages were unveiled on select metro lines in the southern cities of Shenzhen and Guangzhou. In Guangzhou, the metro system moves over 7 million people every day. Highlighting the network’s congestion issues, on April 28 this year a record of over 9 million people rode the ten-line metro system. Mondays to Fridays between 7:30am-9:30am and 5pm-7pm, women will now be able to take refuge from wandering hands in designated ‘priority carriages for women’. Promoted as a progressive intervention into the issues of sexism and assault, it is also the subject of some controversy. The majority of media attention, however, has focused on men’s needs and general overcrowding on the metro, such that men too can travel in the ‘priority carriages for women’. Beyond this, the government’s explanation for the carriages has been couched in the view that women’s bodies, lives and safety only count in relation to childbearing. Its public statements have highlighted that the carriages are ideally for pregnant women and mothers with young children. 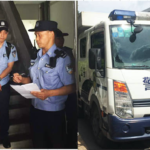 As Xinkuaibao stated, “the establishment of women’s carriages should not be understood in such narrow and vulgar terms as ‘the prevention of sexual harassment’”. This prompted the legitimately angry response that women “shouldn’t have been so ‘vulgar’ to assume that the women’s carriages were set up in order to express ‘concern for women’ and oppose sexual harassment — apparently their main concern is not for us but for our children, the children still in our bellies, or those we’ll have in the future!’” How space is regulated in this provisional change to Guangzhou’s public transport system actually entrenches conventional familial forms, modes of reproductive labour and anxiety about the current birth rate. While we are not concerned with calling for greater legal regulation of the carriages as a sole remedy to sexual harassment, we do think that this case highlights the dynamics of force pertaining to social conflict in China today. One thing is certain: the implementation of women-only carriages signifies that the government has been forced to acknowledge the problem of sexual harassment of women as a social fact. This much it has had to concede, and concede publicly. However, the acknowledgement comes with a so-called solution that segregates women and in doing so casts women as responsible for the possibility of sexual assault. This is not the first time these issues have risen to the surface in China. In 2012, responding to demands for response to the issue of sexual harassment on Shanghai’s public transport, the Shanghai Metro stated on its social media account that female passengers should wear less revealing clothes or else “it would be strange if you didn’t get harassed”. There were widespread protests against this statement, including on the Shanghai metro. Most significantly, in the case of Guangzhou’s women-only carriages, is the fact that the announcement comes in response to years of pressure from feminist groups about sexual harassment in public. 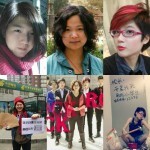 In March 2015, the “Feminist Five” were held for over a month in criminal detention (without being charged) in Beijing for planning a multi-city protest about sexual harassment on public transport. A year later, Guangzhou’s F-collective organised, fundraised publically for and made several poster designs of a billboard announcement for a major Guangzhou interchange station, Kecun. The billboard’s initial message “temptation is no excuse, stop wandering hands” (诱惑非借口，停止咸猪手) and imagery were edited several times in an attempt to appease Government concerns. The final version read “temptation is no excuse, please commute civilly” (诱惑非借口，文明出行) and featured a cartoon image of a cat. Blocked at every stage by Government officials, since March this year the group’s members took their message to the street in a campaign associated with the hashtags “#iamabillboardonthemove” and “#walkingagainstsexualharassment”. They were finally told that only Government departments are allowed to initiate announcements on public transport. In concert with the spectacle of ‘action’ for women’s safety on the metro, state agents and police have questioned feminists in their homes on several occasions this month. 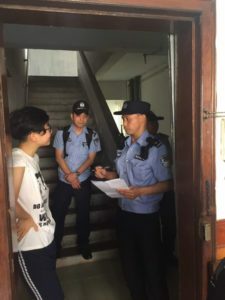 On June 27, Guangzhou resident Guo Jing received a phone call from her landlord: “I’ve been told by the police that your friends are trouble and they can’t force you to move, but I can.” Guo Jing’s housemates include one of the five young women who were detained in Beijing for over a month in 2015. The landlord told her that her tenancy had become contingent on severing ties with certain feminist friends. This kind of tactic isn’t new. Multiple feminist activists have stories of their landlords being pressured by state agents to evict them ‘for being bad girls’, ‘causing trouble’, or for their sexual orientation. The use of rental registration as a pretext for eviction is also a common tactic, since rental registration involves taxes that most landlords seek to avoid. According to Zhang Leilei, an organiser from the F-collective, “they’ve tried to contact my parents, they’ve had me evicted, now they’re threatening my friends and they say I have done a dishonour to China.” Some organisers have even been warned that these forms of state pressure won’t stop until they leave Guangzhou. This is the background to the Guangzhou Metro’s women’s carriages. The policy makes women responsible for removing themselves from certain spaces to avoid harassment, rather than acting upon the causes and perpetrators. It makes individual women responsible for addressing the issue and attempts to circumvent any collective response to harassment. In fact, it is precisely any collective response that the state is eager to locate, erase and/or manage. Therefore the women’s carriages are also a cover for the repression of feminist activism and organising, taking the explicit form of harassment of women in their homes—the space that so often functions as the very basis of domestic and sexual violence. And yet, heading into summer, ‘we should all be feminists’ t-shirts can be seen daily in major Chinese cities like Guangzhou and Shenzhen. Is this trending phrase an expression of a public secret? A latent, but common, set of experiences and grievances, finding at times concealed but increasingly public expressions of desire and refusal? Widespread discontent about sexual harassment is an aspect of this. The possibility of moving from individual or private grievances to a public and collective response offers the possibility of a true challenge not only to sexual harassment, but also to the way that women’s lives are valued, the way gendered norms are reproduced and put to work in the division of labour. In this sense, the new women-only carriage policy has the potential to be risky for the government. In suppressing small groups of feminists, perhaps the government faces little risk of larger scale resistance. But as a wider conversation and opposition to violence against women takes centre stage—seen in part through concessions like the women-only metro carriages, or China’s first domestic violence law introduced just last year—the repression of women who speak out against gendered violence will become less and less tenable. 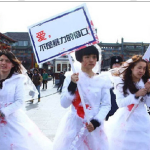 The Chinese state in dealing with recent feminist campaigns is reiterating a long-standing strategy combining repression and recuperation. Yet the strategy takes shape according to the specific conflict. For example, workers’ centres established outside of state control have in recent years faced harsh repression. Some of these independently organised spaces where workers can congregate, socialise and study have been closed, forced to move and had organisers imprisoned. At the same time, new centres that are closely bound to the state have been set up and offer many parallel functions. In that case, as with the women-only carriages, the state represses self-organised activity and recuperates some of the demands with an intention to undermine further collective action. Compared to the worker’s centres, the social dimension of feminist repression is more immediately apparent. For example, it is not immediately obvious that a workers’ social centre, set up in a working-class neighbourhood, funded by the All China Federation of Trade Unions (ACFTU) but not directly part of the ACFTU, is part of an appeasement and strategy campaign to recover credibility and support from workers. On the other hand, in relation to recent feminist campaigns, the response has happened much more publically and thus could prove to be risky for government. Acknowledging certain issues potentially raises more awareness while also sanctioning discontent over sexual harassment, which can provide a wider support for the feminist struggle. For women who are concerned about harassment and sexual violence, the solution being cooked up by the state is not to fight for increased collective power, but to return to an apparently safe haven of the traditional role in the family. Recently revived government efforts to repress sexual expression and queer life can also be seen as further anxiety regarding the processes of social reproduction. The repression of queerness and sexual promiscuity amounts, in part at least, to further pressure women back into the family and to ensure the family as a unit of reproduction. However, as the Chinese economy undergoes transformation, the population ages and concerns grow sharper in relation to social reproduction, conflicts will continue to emerge at the nexus of gender and labour. 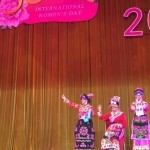 In the repression and recuperation of feminist campaigns in Guangzhou perhaps we glimpse a signal of the future. 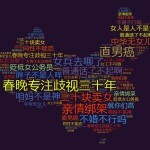 For an official statement and critical discussion of this in Chinese, see 《震惊！“女性优先车厢”很可能不是为了反性骚扰！》(“Surprise! 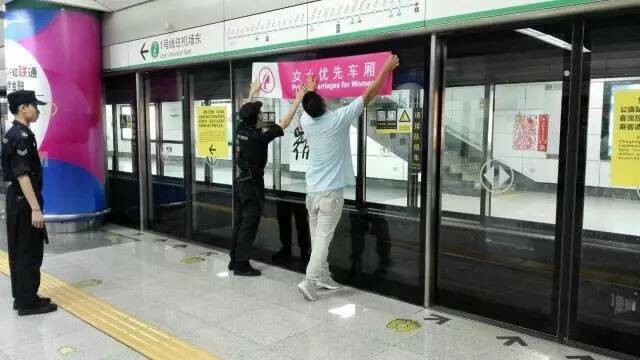 The ‘priority carriages for women’ may not be aimed at preventing sexual harassment”), on Jianjiaobuluo.com (28 June 2017), a mainland Chinese website and WeChat feed focused on feminism and labor issues. Wellwrotten, such an important issue,thank you!